Online Games to Learn English! For teachers / parents: What is Phonics? For homework: play before each lesson to learn all the words. In class: Everyone gets on a different computer, race to see who finishes first! Click here for the Teachers' Notes. If you speak English and find these too easy, try the Korean or Japanese games. You'll soon see how the English games can really help your students! 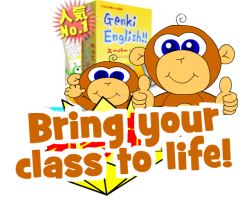 Games from the other themes are in the Genki English Teacher's Set. Plus there are lots more computer games in the Genki English Teacher's Set!